Tonight on the CW The Vampire Diaries starring Nina Dobrev, Ian Somerhalder and Paul Wesley continues with an all new Friday February 26, season 7 episode 14 called “Moonlight on the Bayou,” and we have your weekly recap and spoilers below. 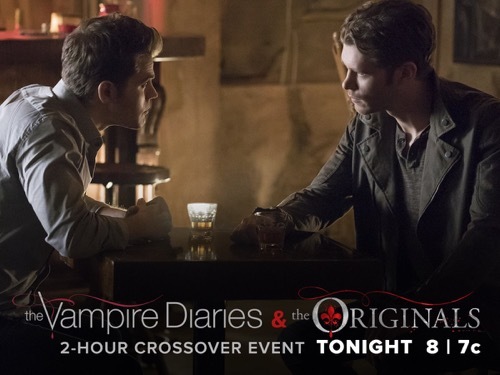 On tonight’s episode, Stefan (Paul Wesley) visits New Orleans to lure vampire hunter Rayna Cruz ( Leslie-Anne Huff) away from his friends in Mystic Falls. In the Big Easy, Stefan meets Klaus Mikaelson, (Joseph Morgan) who becomes suspicious of his old friend’s unexpected arrival. On the last episode, Caroline’s life was put in danger when complications arose from her supernatural pregnancy. Meanwhile, Enzo forced Damon to help him track down Rayna Cruz, a ruthless vampire hunter who was on the loose. However, Damon’s actions inadvertently put everyone he loved in Rayna’s path. Did you watch the last episode? If you missed it, we recapped it all right here for you. You’re not going to want to miss any of the action tonight, so tune in at 8PM EST to the CW to catch the latest. We’ll be live recapping the season 7 episode 14 for you right here and in the meantime, hit up our comments section and tell us your thoughts on this new season! #VampireDiaries starts in New Orleans, three years from now. Caroline brings the twins to a bar and asks the bartender where Klaus lives. The bartender says Klaus is gone and he hasn’t been seen or heard from in three years. Caroline is stunned. Now, Stefan is on the run and Valerie gives him directions to a safe house with a magical disruption spell so Rayna’s sword can’t track him there. He says he pulled over to buy a charger. Valerie says he can’t stop moving but his phone dies and he doesn’t hear her. Rayna raves down the road on a motorcycle. The cashier rings him up and he sees Rayna getting off her bike on the security camera. She throws the sword and he blocks the door with the ice cart and speeds away. Bonnie and Damon pull up at a house and Enzo comes out to greet them. He escorts them inside and says this is the Armory and says it’s a collection of supernatural artifacts. Damon says he hasn’t heard of it and Enzo says that’s what makes it a secret. Damon asks about how they can save Stefan. Enzo says they recruited him to take down Rayna. Bonnie asks why he cares and he says they have something he wants. He says they kidnapped him four months ago and a woman named Alex made him an offer. Alex says he might want to know who his family is since he’s an orphan. She tells him they know everything. He says that’s when he started working for them. He says they need to get Stefan here and then the Armory will trap her. Damon and Bonnie swap looks then agree. Alaric comes and talks to Caroline and says he’s moving to Dallas today. He says everything changed when he saw their faces. Ric says it’s not about Rayna but his promise to Jo that they would leave town. Caroline says traveling with two kids is impossible given driving too. He says he hired a nurse to come along. Caroline says the nurse he hired is a professional BF texter. She tells him to use her instead. She says she’s healed already and can use the distraction to keep her mind off Stefan. Stefan looks at his wound and worries. He goes into a bar and Klaus finds him there. He welcomes Stefan and calls him old friend. Klaus asks why he’s there and how bad it is. Stefan lies and says he’s on R&R there, no reason. Stefan asks about the rest of the Mikaelsons and Klaus says never a dull moment. Damon calls and Stefan ignores it. Klaus mentions locator spells and Stefan says he knows Klaus gets family drama. Klaus calls over the bartender Sylvia and says keep him in booze. Klaus says it was noble of Stefan to stand up for the humans of Mystic Falls. Klaus asks about Caroline and Stefan says they need another round of drinks. Caroline talks to Matt who says he can’t find Stefan’s cell phone. Caroline and Alaric are driving to Texas and the baby noise is chaos. Matt says he has to know where Rayna and Stefan are to help. Valerie shows up to Matt’s office and hands him a map and says Stefan is on the way to New Orleans and Rayna is chasing him. Matt says the irony is that he needs her help because she killed all the sheriffs. Valerie says she kept Caroline alive and is trying to keep Stefan alive too. Nora finds Mary Lou at a convenience store shopping for food and Mary Lou rants about the Huntress. Nora says at least they’re together and are starting over. She hands her a ring pop and slides it on her GF’s finger. They kiss and talk about exploring the world but then Alex and the Armory take them down. Alex says it’s sweet that they’re trying to embrace technology but can’t understand tracking. Valerie tells Damon that the Armory is a black hole of lies. Valerie says they will risk Stefan’s life and tells him to shut up and stop making things worse. She also tells him about St James Infirmary – a safe house. Bonnie asks Enzo about what the Armory knows about his background. He says he was sent to a workhouse at the age of 4. He says by 14 he was on the streets and dead at 27. He says that’s my human life. He says he comforted himself, lived on scraps and fought disease. He says the Armory will give him answers and he’ll do what it takes to get them. Damon says Stefan didn’t renew the minutes on his phone. Enzo blocks them as they start to go. Damon says Enzo is a liar and trickster. He says Valerie told him the Armory is shady. Enzo shoots him and knocks Bonnie out before they can leave. Damon wakes on a gurney. He looks around groggily. He sees Tyler lying on the next gurney knocked out. Enzo says Tyler has been in a coma since Damon attacked him. He says Tyler made contact with the Armory back when he was a Hunter. He says Matt and Tyler were trying to get the Armory to put him away for good but now he works for him. Enzo says they’re just keeping Tyler there until his werewolf transformation takes effect and then he’s good. Enzo leaves Damon locked in with him and tells him it’s a full moon tonight. Bonnie wakes on a couch with Enzo talking to her. He tells her if not for the Armory, Tyler would be dead thanks to Damon. He says he locked Damon in a room with Tyler and says it’s a full moon. He says her bestie better give up Stefan’s location or he’ll be dead. Bonnie chants and nothing happens. Enzo says he injected her with a toy of the Armory and she’s on magical time out right now. Tyler dozes in his coma while Damon stares at him. Damon tries to break through the door. Nothing. He punches the glass – again nothing. Tyler’s eyes open and he looks around. He spots Damon and says his name. Tyler asks what’s going on and Damon says the good news is, tween wolf, you’re about to get revenge on me. Alaric and Caroline stop at a diner and he gets the babies to sleep. Caroline says she has been ranking possible nannies. One of the babies starts to wake and Ric takes Elizabeth to walk around. Then Jody wakes too. Damon tries to tie Tyler down but he says it won’t help once he turns. Damon says it’s taking all his will power not to send him to doggie heaven. Tyler asks why not and Damon says he knows Elena is alive. Damon shoves a syringe of knockout juice in his arms and says good boy – dream of milk bones. He conks out for a second but then Tyler’s eyes open and it looks like the change is starting. Bonnie asks why Enzo is being like this and he says he has no one now that Lily is dead. Bonnie asks why chase a family that gave you away. He says when she heard Damon was in trouble, her first instinct was to help – he says he wants that too. Bonnie hits him upside the head and then shoots a dart into him to knock him out. She uses his hand to open the door so she can get out. Damon calls Stefan and asks if he’s at that place Valerie told him then says he may need a werewolf antidote. Stefan says he’ll see what he can do and ends the call. Stefan told Klaus about Caroline being preggo and siphon babies and heretics. Klaus says no way will Caroline hand over the babies and walk away. Klaus asks why he’s not with her now. He says family drama then asks if he can hand over some werewolf help for Damon. Then Klaus notices him bleeding and says it’s the mark of the Phoenix sword. He asks if he’s made an enemy of Rayna Cruz and rants at Stefan for luring a vicious hound. Klaus says she was born in New Orleans and killed many of his closest friends. Stefan says tell me what to do. Klaus says you don’t draw a huntress to a town full of vampires. Klaus rants at him and says get out. Stefan says she’ll kill him if he leaves. Klaus says if you stay, I’ll kill you. He tells him again to get out then screams it. Stefan walks to the door. Stefan left his phone lying and Caroline calls. Klaus answers – hello love. He asks if it’s been too long for her to recognize her voice. He hears the crying baby and says pick her up. She does and the baby calms down. She asks where’s Stefan. Klaus asks if she wants his daughter’s outgrown onesies. She wants to know where’s her BF? Caroline says she’s miserable and please stop gloating. He says Stefan will be fine, he’ll make sure of it. Klaus asks if children were in her plans and she says no and these aren’t hers. Klaus says his family challenges the bounds of his sanity and finds inventive ways to torture him but makes him truly happy. Klaus says it’s okay to love what you can’t explain. He says he’s sorry about her mother. He says he knows she would have loved to see her with those babies. Caroline says the baby is sleeping. Klaus whispers and says we mustn’t wake her then says goodbye. He ends the call. Tyler is struggling while Damon beats at the windows. Tyler says just tell them where Stefan is but Damon says his brother takes bullets aimed for him. Tyler breaks his restraints and says he’s going to turn and tear his throat out and that will end it. Bonnie is there and tries to open the door. She says Enzo blocked her magic. He says you need Enzo’s had. He says hurry up or Tyler will eat me. Bonnie takes an ax and says this is what happens when you make enemies. She tells him she would have made a better friend and hacks off his hand as he screams. Stefan calls Valerie and says he lost his phone. He says he’s back on the road and Damon needs his help. Valerie says go back. Matt reports to Valerie that there’s a speeding motorcycle going east on 90. That’s where Stefan is too. Stefan is out of cell range as he pulls over. He sees an arrow is in his tire. Rayna is there and shoots him twice with her crossbow then comes at him with her sword. She kicks him down and then tries to stab him. They fight as the blade slips closer. Klaus is there and kicks her off him then helps Stefan up. Klaus says she’s out for now but Stefan wants to take her. Klaus says they’re in wolf territory and says let’s go. He zips away and Stefan looks around then follows. Tyler tells Damon he won’t last 60 years without screwing up. He tells Damon if he opens the door, he’ll kill Bonnie too. Tyler says their friends will keep trying to save Damon until they all die. Damon tells Bonnie no and she says she won’t let him die in her but Damon says it’s his mess. Tyler shifts and Bonnie opens it. She tries to stop Tyler and she’s injured horribly. Damon says get out of here before I kill you and Tyler runs off. Damon feeds her his blood but he sees she’s not healing. He tries again. Damon picks her up and carries her out. Enzo wakes to Alex staring at him on a gurney. His hand is bandaged and he sees blood on the glass. She says she found that hand and thought it might be wanted. He says he’s done working for her and Alex says they just needed him to prove himself. He says four months that brought him nothing and he rants. He says he has no answers, no family. Alex says his father founded the Armory and he lived and died there. She says this place is his birth right. She says she didn’t know she had family either. Alex says her name is Alexandria St John. She says she’s his family. Caroline tells Ric the girls are asleep and the furniture is on the way. They eat and she asks if he looked at the nanny list. He says he set up an interview with her first choice. She offers to compel her to lower her fee. He says it’s good and Caroline says her work here is done. Caroline says she’ll stay the night if that’s okay to make sure things are okay. Ric says stay as long as you want. She smiles. Bonnie is at the hospital and Damon sits at her side holding her hand. He says go ahead ignore me. He says once the stuff Enzo gave her is out of her system, he’ll heal her. Then he tells her that she’s his friend, his bestie. He says if she died, he would have years of guilt and self-loathing. He says he doesn’t want to drink in a new drinking buddy. He says neither she nor Stefan are supposed to die for him. Damon says it all ends tomorrow. Klaus is with Stefan and he asks if Stefan loves Caroline. Stefan asks if Klaus has feelings for her. Klaus asks if he was protecting Caroline but Stefan says he was shielding Damon. Klaus says let Caroline go then says he’s spent an eternity watching Elijah sacrifice relationships for her. Klaus says he’s not putting him on a train, he’s taking him to see a witch about his Rayna Cruz problem.